Business strategy must be simple. It’s a mantra we’ve preached since we were executives in Fortune 500 organizations and continue to convey to our clients today as consultants. We have learned that an effective strategy is the guiding force driving organizational execution, performance and financial results. Strategic decisions are tough so the framework for business strategy must be simple. 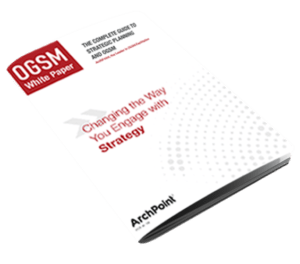 Download the guide to strategic planning to learn ArchPoint’s step by step process to successfully developing and executing your company’s strategic plan. What you’ll learn in this whitepaper. We’ve helped hundreds of organizations develop and execute their strategies with OGSM.